The menu is impressively focused. 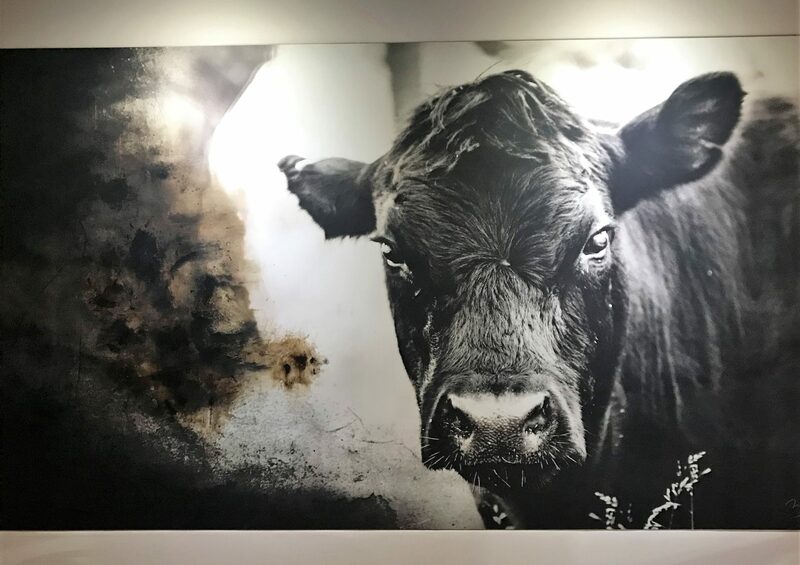 There is nothing to steer clear from on the menu because every dish plays a part in communicating the ethos of the restaurant. This also means it’s not a huge menu. It doesn’t have to be. There’s enough variety to keep things interesting, but not one entry is superfluous. This is such a refreshing and confident choice. It encourages trust in the chef. This was our third visit to Coop 303. The first was not long after they opened. Our experience was overall fairly good, but we had heard lots of mixed feedback, and a few dishes missed the mark. With the undertaking that is operating Coop 303 we decided to give them a little more time before writing anything. Our second visit was strictly for fried chicken as part of ranking the best fried chicken in Jax. The first dish we dove into was Coop 303’s most popular appetizer, Peaches and Cream. This dish consists of fried green tomatoes, topped with burrata cheese and peach jam atop of a bit mustard balsamic. This dish has the feel of an item you’d find on an expensive chef’s tasting menu. 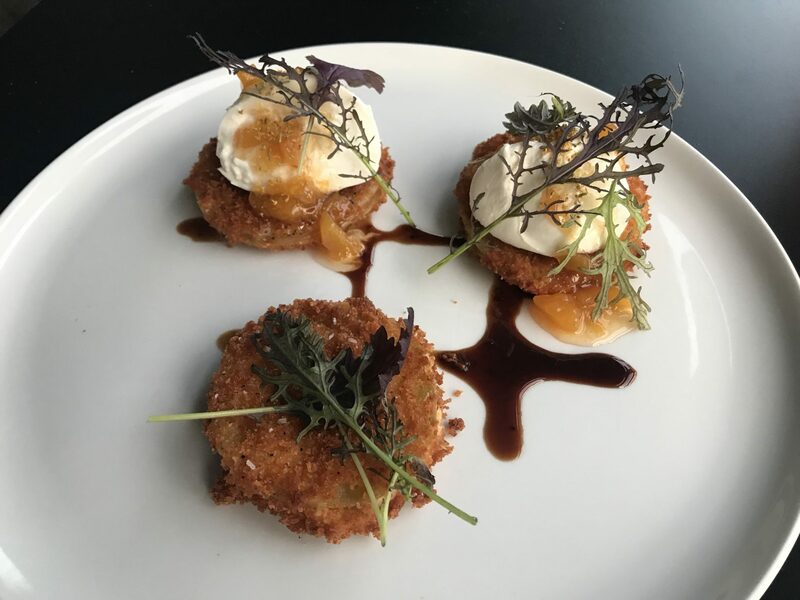 The savory and warm fried green tomatoes perfectly contrast the cold mild burrata which offers a wonderful canvas to showcase the sweet flavor of the peach jam and the subtly tart mustard flavor of the balsamic. Every bite was sheer delight! This dish will likely go on our next list of 10 Dishes You’ve Just Got to Try in Jax. We can’t rave enough about it! 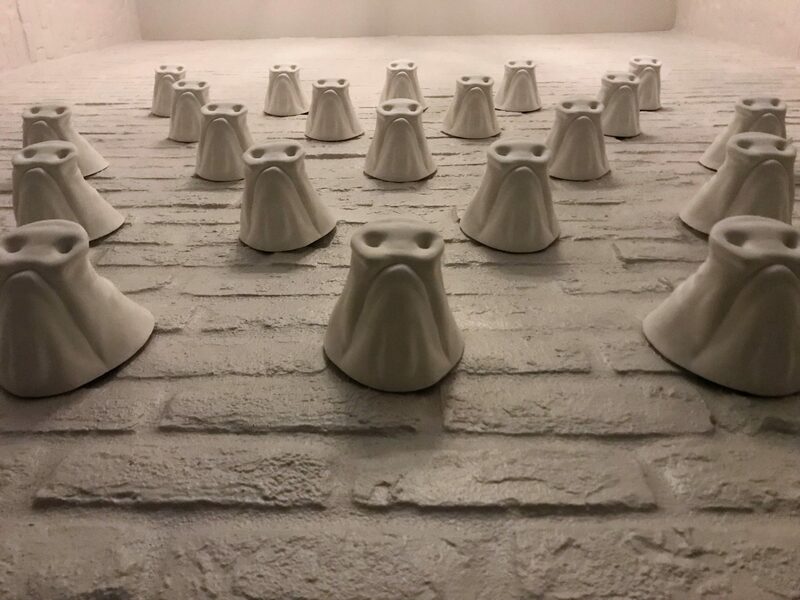 The cauliflower bisque was an equally memorable dish. 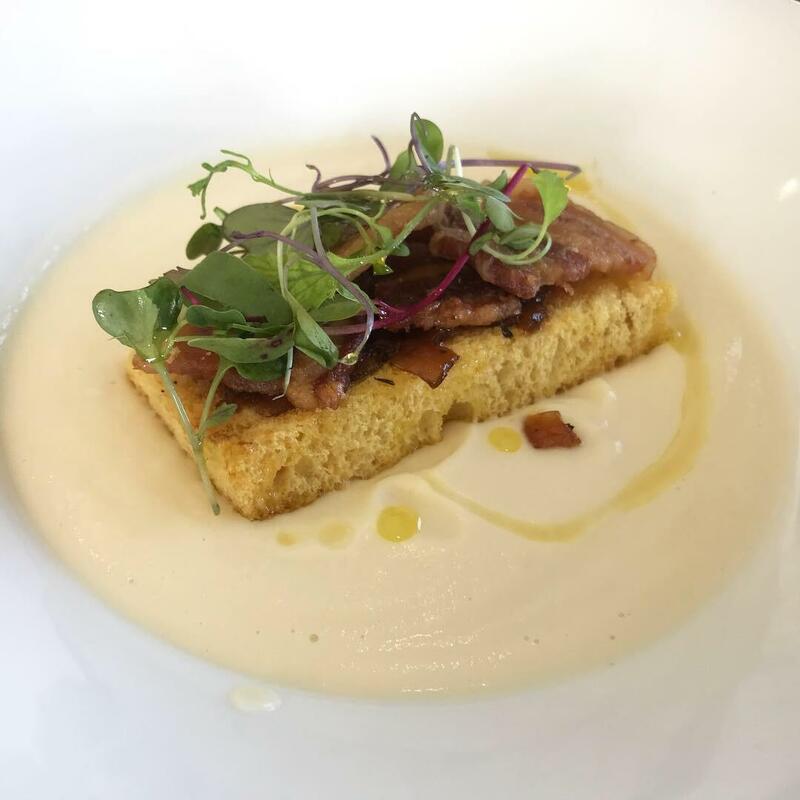 The soup was blissfully creamy with crunch from the brioche toast, and a savory, salty, earthy flavor from the Cheshire bacon and onion jam. This is an explosion of flavors and textures and we ate every bite. I’m pretty sure we picked the bowl too. The Fried Pimento Cheese was different than we expected. 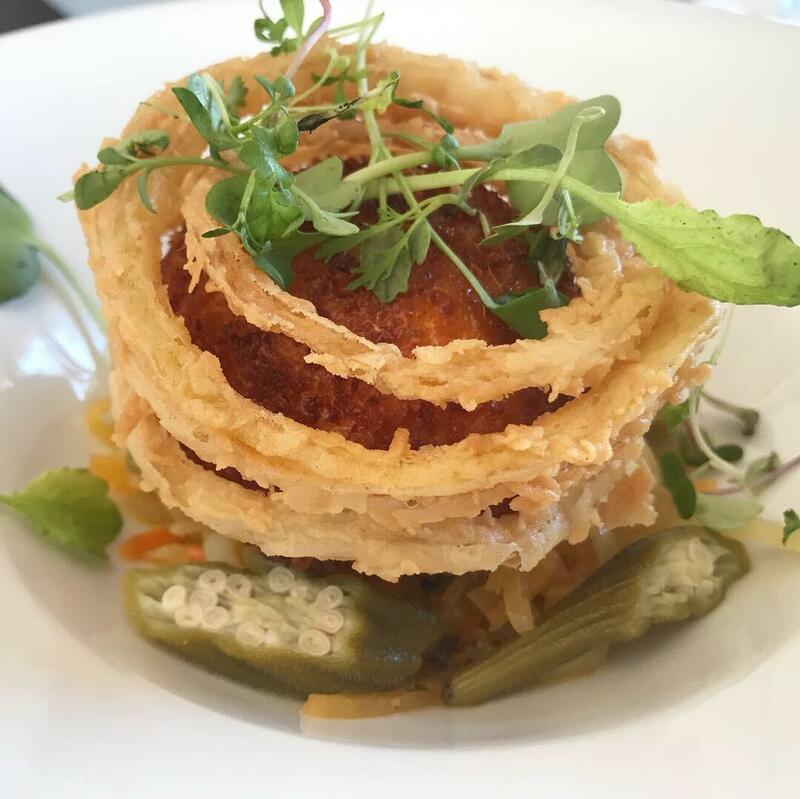 It came almost as medallions of fried pimento cheese, with contrasting flavors in the root vegetable escabeche, okra, and tobacco onions. I almost didn’t know what I was eating, but it was really good. Pimento cheese lovers will be big fans. Next we dove into the chicken and waffles. 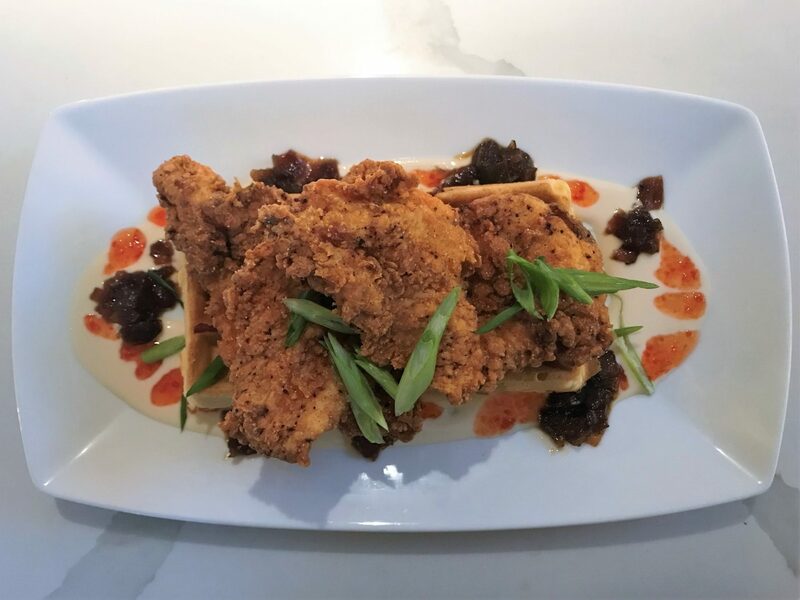 Bacon waffles come topped with boneless fried chicken breast and are served atop a maple crema, onion jam and datil pepper jelly. This dish was a generous size with a few pieces of boneless fried chicken on top. The waffle was fluffy and substantial, and the bites with bacon in the waffle were extra nice. The maple crema is exactly what you’d expect, sweet and creamy. We loved this dish even more with a drizzle of house made spicy honey, but pure maple syrup is available as well. Surprised to find what appeared to be a unique and exciting vegan option on the menu, we ordered the Rosemary Grilled Oyster Mushroom entree. 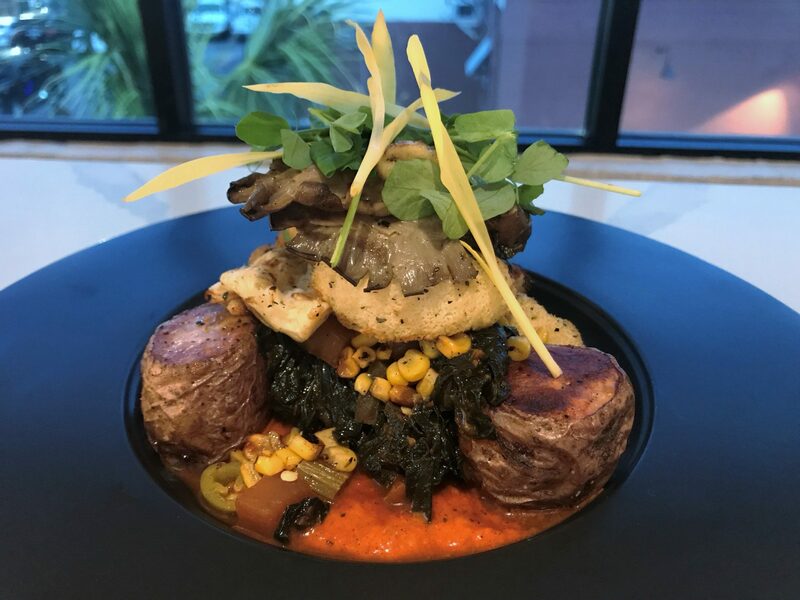 The Rosemary Grilled Oyster Mushrooms come with collard greens, Florida corn, roasted potato, and vegan romesco sauce. The day we dined they also had lions head mushrooms and included those in the dish as well. Oyster mushrooms are such a treat and this dish did not disappoint. The romesco had a kick, the roasted potato had an almost creamy flesh, and the collards were full of flavor. Anyone who’s a fan of mushrooms will certainly enjoy this dish. We also ordered the Crispy Skin Salmon and Fried Chicken. 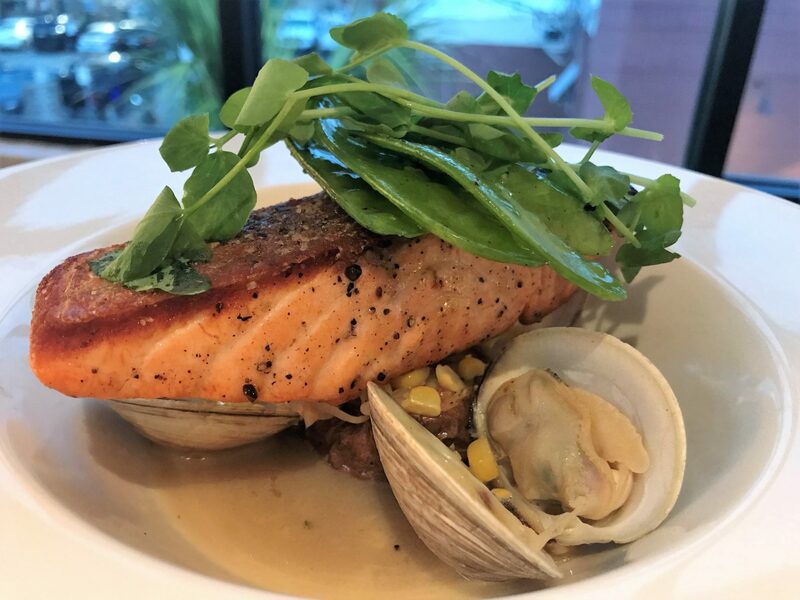 The Crispy Skin Salmon came over Florida corn broth, Cedar Key clams, roasted potato, and snow pea salad. Aside from the salmon itself, everything else in this dish is sourced in Florida. The roasted potato is the exact same iteration as the Oyster Mushroom dish. The salmon itself is pretty darn perfect. The crispy skin adds a texture that completes the dish. The corn broth is so mild, but at the same time is this beautiful savory broth with layers of flavor. You can taste each aspect of this dish in the broth: corn, clams, salmon, snow peas. I told our waiter I wanted to drink it. I’m not usually big on salmon, but I would make a special trip to Coop 303 just for this. We recently ranked The Top 5 Spots for Fried Chicken in Jax and Coop 303 came in #2 on that list. On our first visit Coop 303 stumbled a bit and served us a badly prepared and over-salted version of their signature fried chicken. On the day where we traveled the city of Jacksonville to try every relevant fried chicken in town, Coop 303’s fried chicken was absolutely incredible. They didn’t know we were coming and didn’t know who we were. It was every bit of the juiciness and flavor you dream about when you picture biting into incredible fried chicken. When they’re on their game their fried chicken is pretty incredible. For sides we tried the mac n cheese and the cheddar biscuits. The mac comes in a small crock topped with cracker crumbs. Like so many other dishes on the menu, this mac is involved. It has several flavors going on, coming together to make an enjoyable, cheesy mac experience. 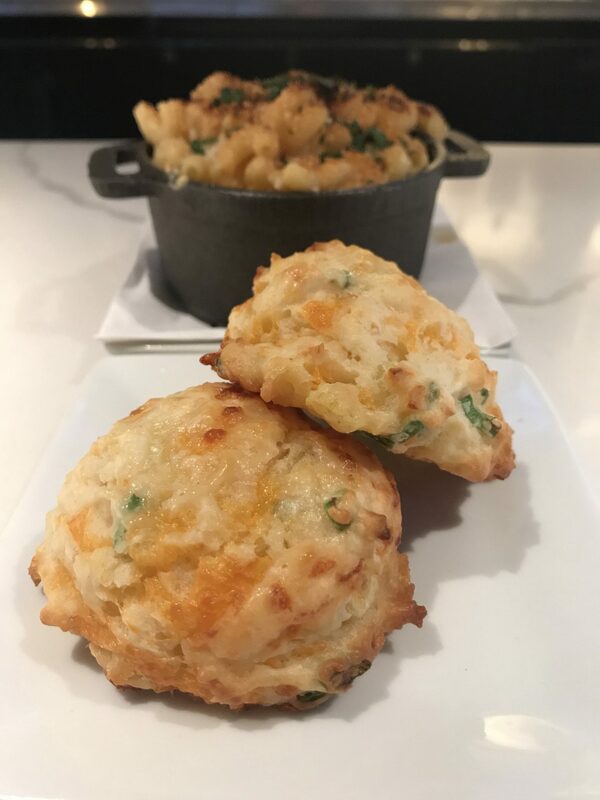 The cheddar biscuits draw a parallel with Red Lobster’s cheddar biscuits, but these are less greasy. They come two per order and we would definitely get them again. For dessert we were taken in with the Bacon Bourbon Sundae: white chocolate-butterscotch blondie, bourbon caramel, candied bacon. This dessert was lights out delicious and extremely rich. It’s definitely one to share. The blondie is super sweet, and the candied bacon has just enough salt to cut some of the sweetness. That perfect bite with a little bit of everything in it was simply divine. We’ve been to Coop 303 three times, though the fried chicken expedition was take out. Once they knew we were coming and twice they didn’t. The service was fantastic both times we dined in. Our servers were knowledgeable about the menu, had great recommendations, and added to the experience. I know in the first month or so there were some struggles, but they truly seem to have things ironed out pretty well now. If you had a rocky experience we encourage you to go back and give it another shot. Coop 303 isn’t the restaurant we expected. The food is far more involved, the service is better, and the experience more unique than we anticipated. 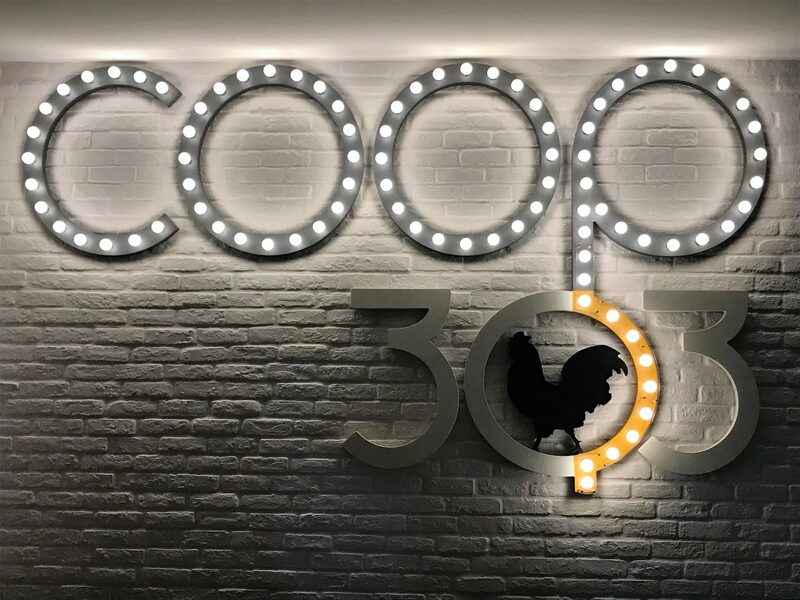 With the way the restaurant is designed, this is not an easy restaurant to keep running smoothly, but Coop 303 seems to have found their mojo. We hope they keep it for a long time. 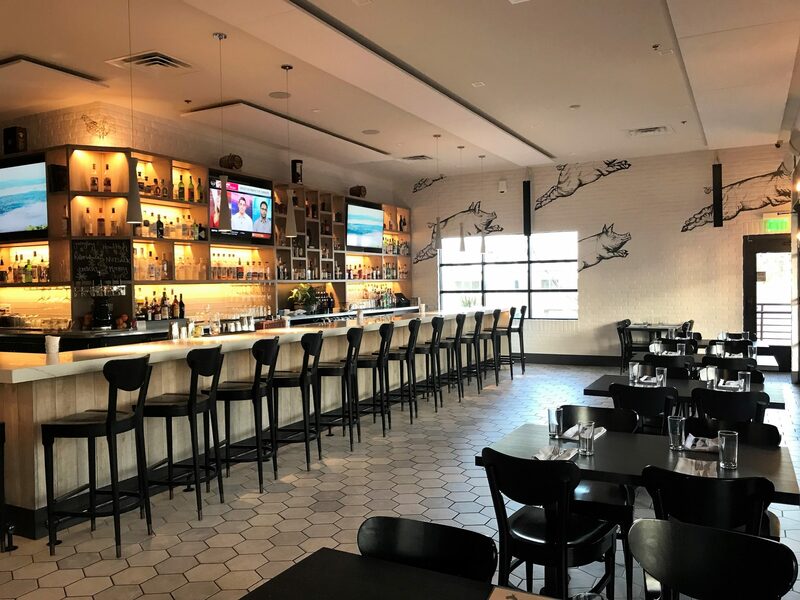 Tagged Alcohol Serving, Bar, beaches, Beer and Wine, Date Night, Dinner, farm-to-table, Full Bar, happy hour, local, lunch, outdoor seating, southern. Bookmark the permalink.